Located on Tremont Street, the Granary Burying Ground is the final resting place of some of America’s most important historical figures. 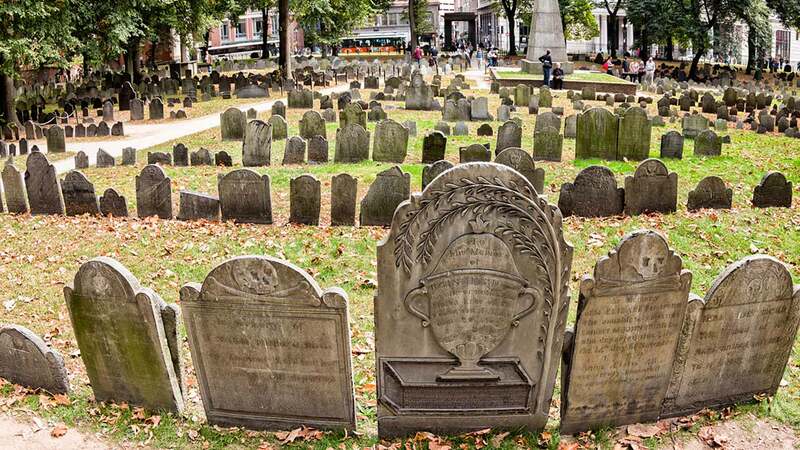 Samuel Adams, John Hancock and Paul Revere are among the famed patriots who are buried here, along with the family of Benjamin Franklin, several Massachusetts Governors and the victims of the Boston Massacre. But many who visit this ancient burial ground don’t do so just to view the headstones of famous Americans. It’s also to discover if the stories are true – do the spirits of the dead haunt these hallowed grounds? According to paranormal experts, Granary is one of the most haunted places in Boston. It’s here that many people have experienced strange and inexplicable encounters. One of the many mysterious events that seem to occur often is when visitors take pictures. After leaving, they view their photos only to discover floating orbs and shadowy faces that were not visible to them while they were on the property. Other paranormal reports include the sound of disembodied voices, cold spots and the sense that someone is watching you. Investigators have also said they picked up voice phenomena on EVP devices as well as disruptions in electronic fields using EMF detectors. With its centuries of history and victims of war and bloodshed, it is not surprising that this old burying ground is haunted. One of the Granary ghosts is a famous lawyer, James Otis, Jr. He lived during the time of the revolution and was said to have had an argument with a British tax collector in a local pub. When the tax collector hit Otis over the head with a bottle, the lawyer became mentally incapacitated and was so dismayed over his condition that he wrote a letter expressing his wish that God take him away to eternity by a flash of lightning. It wasn’t too long after that Otis was killed after being struck by lightning in a thunderstorm. Perhaps the colonial figure that many visitors have spotted is the spirit of Otis himself. Nobody knows for sure – except that a large figure dressed in colonial garb has been known to appear. Discover if the reports are true by joining our haunted tour of Boston. And remember: If you’re walking through the graveyard and you feel something cold touching your cheek, chances are it’s the hand of one of the lingering souls reaching out to you.